Afghanistan are early favourites to make it into the 2016 Asia Cup, but can there be upsets? The Asia Cup tournament for the year 2016 would be held as a series of T20I matches, making it the second biggest International T20 tournament. Asia Cup which has been held as an ODI tournament hitherto, from the year 2016 onwards would see the format being alternated between ODI and T20I every two years, in order to provide match practice to the Asian teams before world cup tournaments. Hence, next year’s Asia Cup would be a T20 tournament, aiding the Asian teams to prepare for the World T20 in India in March and April. The tourney is most likely to be held in India, preceding the flagship T20 event. The last year’s Asia Cup, which saw Sri Lanka beating Pakistan in the final to win the cup, had one associate team, in Afghanistan along with the four full member Asian sides. This time too, an Associate nation will have the chance of locking horns with its big brothers, making the Asia Cup a 5 team T20I tournament. But unlike the last Asia Cup, in which Afghanistan directly qualified for the main tournament, this time the Associate Asian teams will have to play a qualifying round to earn their birth to the mainstream tournament. All the Asian teams that qualified for the 2016 World T20- Afghanistan, Oman and Hong Kong – would take part in this qualifying tournament along with the hosts UAE. The tournament is likely to be held during the month of November. Nepal, should consider themselves unfortunate to have been denied an opportunity to partake in this tournament, having also lost their place in the 2016 World T20. Even though only the teams that measured up to the WorldT20 are taking part in this tournament, it should be noted that UAE has been given the license to be a part of this tournament on the basis of being a host. It is fair to feel, that Nepal could have been given a chance, given what the country as a whole has gone through in the last few months, with two earthquakes rocking the entire country. A chance to be a part of a multi-national tournament might have been the ideal succor the cricket crazy nation of Nepal needs. 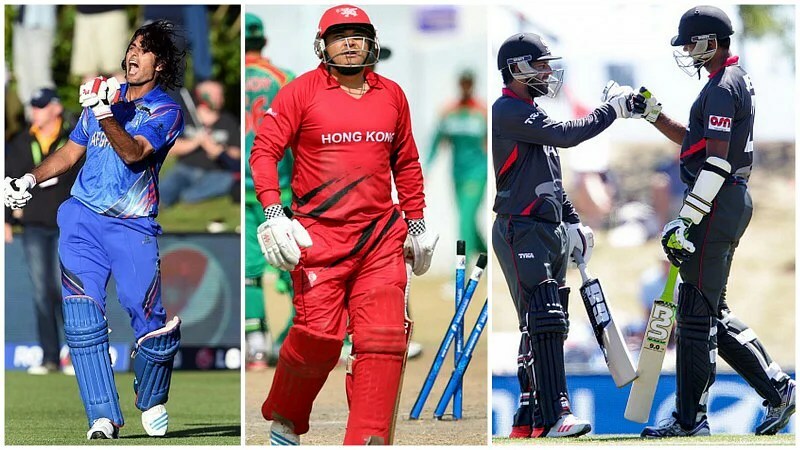 Nonetheless, Afghanistan, Oman, Hong Kong and UAE will provide some exciting cricket with games among these teams in the recent World T2o Qualifier engendering mixed results. The country bordering the Hindu Kush range is easily the most dominant team of all associates. With power packed batsmen capable of packing a punch patrolling the batting line up, the mountaineers of Afghanistan form what can be termed as the second best fast bowling regiment in South Asia. The burly opening batsman who also keeps wicket, Mohammed Shazad can dig into any team’s bowling on his day. In the 2015 World T20 Qualifier, the right hander scored two back to back fifties, both with a strike rate in excess of 200, helping his team thoroughly vanquish the opponents. A brace of ducks in the last two games of the tournament elucidates that he can be erratic. But Afghan’s batting line up is steel powered that his failures will hardly have an effect on the outcome of games. Despite Shazad bagging ducks in the last two games, Afghanistan managed to clinch victory, that too comprehensively which stands as a testimony to Afghanistan’s overarching strength. The captain, Asghar Stanikzai, who is Afghanistan’s number three, is the team’s medicine man among the candy shop batsmen. His composed, yet considered aggression has been the lynchpin around which the teams’ batting revolves. In the qualifiers, the skipper scored consistently well, making sure the failure of the aggressors didn’t affect the team’s batting. Saimullah Senwari, Mohammad Nabi and Najibullah Zadran make up the middle order of the South Asian team. Their ability to hit big has ensured that Afghanistan always capitalized on the start their big hitting openers provided. Shapoor Zadran, Dawlat Zadran and Hameed Hassan constitute an insuperable fast bowling line up and the presence of spin bowling all-rounders throughout the batting line up ensures that on slow surfaces they can exasperate any batsmen. Despite finishing fifth in the qualifiers, Afghanistan managed to beat both Scotland and the Netherlands, the two teams that eventually shared the Qualifiers trophy. Had it not been for an upset defeat in the hands of Hong Kong in the playoffs for a spot in the semi-finals, Afghanistan could have finished higher than what they actually did. Oman too managed to upset Afghanistan in the group stages, but the gallant Afghans made sure that the Arabic country didn’t run away unavenged, as they beat them in the 5th place playoff match. Unlike the Netherlands and Scotland, Afghanistan lost only one game- an upset defeat against Oman-, whereas the two European nations lost two each. Two of Afghanistan’s matches were rain washed, making them end up with exactly the same number of points as both Scotland and the Netherlands. A victory in one of the abandoned games would have catapulted them straight into the playoffs and made them finish higher in the ranking table. Hoping that fate doesn’t collude against them and saving any upsets, Afghanistan should be able to emerge as forthright winners and should hence, be able to make it to the Asia Cup for the second time in the row. Oman had a fairytale World T20 qualifiers as they managed to cause an upset defeat against both Afghanistan and the Netherlands. But they stumbled against Kenya in their first match and lost to Afghanistan when they met them for the second time in the tournament in the 5th place play off. Replete with a lot of expatriates, it is very difficult to assess the strengths and weaknesses of the side, given the constant variation in the team combination. Oman lost only two games in the group stages and lost to Afghanistan in the 5th match playoff, giving an aggregate of three defeats in the tournament in total. The experience of various expatriate cricketers who have played competitive cricket in both India and Pakistan, will definitely give them an edge against their opponents. At the same time, lack of cohesion within the team, for most of them a part time cricketers conglomerated only during tournaments might very well prove to be their nemesis. Though the players are individually talented, whether they would be able to deliver as a team against quality oppositions is a million dollar question. It should also be noted that the two upset victories of Oman came as a result of batting collapses. The Dutchmen were once looking at a target of 150 plus but lost five wickets in 10 balls adding only one run to their total and eventually got all out for 135. The Afghans lost 4 quick wickets between the 14th and the 16th over, completely derailing the locomotive that was cruising towards victory. Therefore, it is a question whether much can be inferred from their victories against the much stronger Associates. Saving any probable upsets, it is highly unlikely that they would be able to reproduce their heroics in the qualifying tournament of the Asia Cup. Oman are least likely to get through to the Asia Cup, but one thing is certain that they cannot be written off completely. Much like Oman, the Chinese team caused two upsets by beating Ireland and Afghanistan in the group stage and the playoffs respectively. Hong Kong beat Ireland thanks to a batting collapse that saw the Irishmen lose 4 wickets within three overs for 13 runs. Against Afghanistan, Hong Kong was staring at defeat before Mark Chapman pummeled a 25 ball 40 to skyrocket his team towards victory. Though the two victories might make them seem like giant killers, the defeats against Jersey and United States are alarming. The team heavily depends on the 25-year-old Irfan Ahmed and the 21-year-old Mark Chapman and phenomenal performances from them would allow them to upset any giant teams and their inclination to rout much-fancied teams, as they showed against Bangladesh in Chittagong in last year’s World T20, clearly shows that they are a side that can book a birth to the Asia Cup, next year. United Arab Emirates is the weakest of all teams, with them participating in the tournament only on the basis of being hosts to the qualifiers. The Arab team was beaten black and blue in the qualifiers and managed to eke out a victory only against the Canadian side. They are least likely to make it to the Asia Cup, but if they manage to do so then that would mean, the other teams would be heavily affected in a way that they will be denied the much-needed match practice ahead of the World T20. Out of all the Associate nations, Afghanistan seems like the most probable candidate to compete with its big brothers, but Hong Kong’s chances cannot be completely sidelined. Oman may cause an upset if stars align to collude against the better teams and UAE is least likely to be a major force in the tournament. So, to conclude barring any glorious uncertainties, the Asia Cup in 2016 is once again most likely to be yet another tussle among the South Asian countries.